Send A Message To Trinity Nina. Intuitive/Spiritual Counsellor in Calgary, Alberta. Trinity grew up in Montreal, Quebec and later moved to Calgary where she studied Psychology at the University of Calgary. She completed her undergraduate degree in Neuropsychology followed by her Master of Counselling degree. 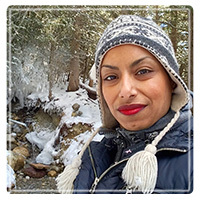 Intrigued by the human psyche, science, and spirituality, she continued her studies in pursuit of her Ph.D. in Metaphysics and Pastoral Counselling at the University of Sedona. Trinity specializes in depression, anxiety, post-traumatic stress disorder (PTSD) and chronic pain due to her personal struggles with Rheumatoid Arthritis and Fibromyalgia. She is also a certified Energetic Medicine Practitioner and incorporates REIKI, an ancient healing practice grounded in Japanese Medicine, into her sessions for the management of chronic pain and chronic illness. She works with individuals of all age groups as well couples and families as a whole. Trinity provides a holistic and integrated approach to health and wellness counselling grounded in both Eastern and Western philosophy, including Cognitive Behaviour Therapy, Equine Assisted Therapy, Mindfulness Meditation, Christian/Biblical Counselling, and Integrative Body Therapy akin to practices of Tai Chi and Yoga. In her spare time, you can find Trinity creating art and spending time in nature walking her dogs, running, riding horses and her motorcycle. She is also a vocalist and volunteers as a Pathfinder Leader with Girl Guides of Canada.